In 2011, Freedom from Torture (previously the Medical Foundation for the Victims of Torture) delivered a 5-day training programme on behalf of PRI on holistic rehabilitation for survivors of torture. The training aimed to promote holistic and comprehensive programmes of rehabilitation based on existing models of international good practice and was devised for multidisciplinary groups of participants from the legal and clinical professions, including lawyers, human rights defenders, doctors, psychologists, counsellors and social workers. The Content Manual (available in English and Russian) combines theory with practical examples and case studies. It includes discussion questions, comments and feedback given by participants in the 2011 training programme. The Facilitators’ Manual (available in English and Russian) provides trainers with detailed guidance on running the 5-day training course, so that learning and new thinking about holistic rehabilitation can be cascaded and shared with experts in their regions. 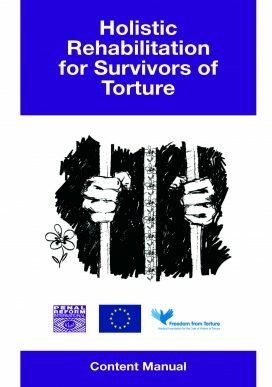 These manuals were produced under PRI’s project, ‘Strengthening institutions and building civil society capacity to combat torture in nine CIS countries’, with the financial assistance of the European Union.